What does it mean when Air Comes Out Of Compressor Intake, and how to you fix this? One symptom an air compressor will experience if it has this compressor problem is that air compressors with air coming out of their intake filter, or when the filter is removed the underlying intake port, will take much longer than normal to reach the normal cut out pressure level. The time change from when the compressor had no issue with what it is displaying now will get greater as the problem intensifies. Or, the compressor may never get to the normal cut out pressure setting. That will lead to other issues including the motor perhaps shutting itself down on thermal overload. Most air compressors have some sort of air intake valves. Their shape, design and location on the compressor will vary as there are a host of air compressors on the market, from fractional HP DIY up to compressors with hundreds of HP electric motors. 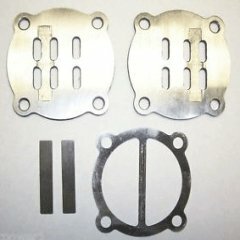 The following image is that of a Campbell Hausfeld air compressor valve plate kit. The two strips seen in the image are the valves, one being the intake valve and the other the high pressure valve. The purpose of the intake valve in the air compressor pump is to open to allow air into the compression area of the pump when air is to be drawn into it, and then to close to prevent that air from escaping when the pump moves into its compression cycle. How each air compressor compresses air will vary depending on the type of compressor, but in every case, once air is pulled into the pump, it should not get back out of the intake valve. When air comes out of the compressor intake while the air compressor pump is running, it indicates that the intake valve is failing, or has failed completely. It is time to tear down the pump to repair or replace the intake valve. Before starting that job however, use Google and search for spare parts for…. your compressor make and model number. Many lower cost DIY type air compressors use common valve plate kits, and you may get lucky and find one for not a lot of money. On the other hand, you may not find a kit for your compressor at all, and that will lead you to making your own valves. This may not be too difficult for most, and you can see how by reading that page on this site. A strong suggestion for you; if you need to replace the valve plate, and your existing pump has gaskets in and around the valve plate, you might as well replace the gaskets while you have the pump apart, as leaking gaskets are another common cause of air compressors that run and run, but don’t build pressure as fast as they used to, or don’t build air pressure at all. Do you have a question about why Air Comes Out Of Compressor Intake? Please add you comment here along with photos to help others help you with your compressor and equipment problem!